Well, another night has come and gone and Felicia is back on the porch. This time, she has found the umbrella under which to hide! LOL! I have 5 birds whom I call the “Fabulous Five” but only one of them is not fabulous in eyes of the other four. When dusk comes, it appears that the four do not allow the 5th, Felicia to come into the coop. I noticed earlier that they didn’t allow it to eat or drink and would peck at her when she came near. This was not too concerning because everyday they are free-range birds so Felicia could easily find food and water on her own. At night though, she definitely must go inside of a coop for her safety. So far, this is day 4 that she has found her way to my back door and has not gone “home”. Every night I say to her, “Felicia, go home”. The first night she was on top of the grill. Day 2, she crouched behind the grill. Day 3, she found herself behind the grill but had turned completely around as if to hide. Ha! Last night, the umbrella had been placed on the patio to dry and she took opportunity to get beneath it like a movie star or something! As usual, I grabbed her up, tucked her wings under my arms, stroked her neck and explain to her that she had to go home. “Go home, Felicia”. The answer to this is really simple. No more free-ranging for the “Fabulous Five” for at least a week and in addition, I will change up the run with perches in different places, food bins changed and in the night, I’ll add a new hen or two with the “Fabulous Five”. Felicia must stay in her coop for at least a full 7 days or more until she’s acclimated with the new group, and then, I’ll let her free range again. If then she ends up back on the porch, I will say “Go Home, Felicia” and not let her out again. It’s for her safety. So, how would you like to see some 6,000 plus birds in one place? I know! It seems cray, cray ,but at the Ohio National’s Poultry show that’s what was there… some 6,000 birds! It was really just something walking up and down the rows looking at the various types of birds on exhibit. From bantams to Turkeys, this show had it all. The Ohio National is one of the largest shows in the United States. It offers hundreds of awards to be given the a variety of winners in including “Best in Show” and a number of other awards. From ribbons, plates, plaques, trophies to golden cups, the awards were on display for all to see and many to desire. The Open, held in the Expo area is held every year in the late fall . It’s slated such that anyone following show rules can participate. Certainly that’s why there were so many birds on exhibit. Judges walk the rows holding every single bird until the entire show of animals have been seen, held and considered for quality. The entire show lasts only a Saturday with awards given out on Sunday. I left my girls and 3 roosters today to go to what I call the “Super Bowl”of Chicken Keeping”, the Ohio Nationals. It’s hundreds of miles from my home, it’s going to cost a small fortune to go and it is my first venture there but I had to go. I just had to. The Ohio National Poultry Show will have as many as 6,600 entries. Can you imagine the sounds coming out of that area? It’s held in Columbus, Ohio. It’s going to be cold weather; like 28 degrees. (uh, I’m from Florida where it was in the high 70’s yesterday! Hummm. From youth scholarships for bird raising and poultry participation, this event is the largest chicken event in the United States. The trophy area is eye candy for those who love awards and they are given in great number at this event. Upon leaving home, I try to leave things so that when I come back, all I have to do is unpack. Also, I think about what would happen if others had to come into my home while I’m gone, so I tidy up and get things sort of “together”. Upon leaving the chicken yard, I feel the same way. Leaving it tidy for the girls and guys and for the chicken babysitter is just as important so I clean, rake and work before I go. While saying my goodbyes to the girls and roosters, I worked and talked. I raked the entire chicken yard area, scanned along all chicken runs for holes or bent wire and made sure that all gates fastened tightly. It was a huge effort but it was a labor of love because I would not see them for a week and as someone else (my daughter) would care for them, I wanted things to go well. I’m leaving the home place and the chickens for a week but in my heart, I’m going for them. From this visit, I hope to learn more about chicken keeping and from the experts who win trophies! Maybe I’ll win one myself one day if I enter one of my beauties into this Super Bowl event. Ohio Nationals Here I Come! Don’t forget to join us on our Facebook Chicken Lives Matter group page. We are in need of chicken keeping experts to weigh in. Join Today! Hurricane Irma is on the way. We’re all really just waiting and waiting for something to happen. By the time she gets here, we’ll all be 20 lbs heavier eating all of the food we bought to prepare for her visit and we’ll all be weak as water laying around now that everything is done in preparation for her. Wow! The chickens are happy today though. I knew that tonight I will close them in their coops so I let them all free range and enjoy the fat of the land. They have had to skip around the water puddles and in some instances grab a fly off of a floating leaf but all-in-all, they are happy to be out. I’ll let you know how Hurricane Irma did when it’s all over. With the devastation and passing of Hurricane Harvey and the up-and-coming storm Irma, many are concerned about their chickens. When you have a couple of chickens, you can easily put them in the bath tub or box during a storm. If you have a handful, you could secure them safely in a crate. When you have two hand-fulls, a cage in the garage might be best but when you have dozens of yard birds, you must do something to keep them safe and all the while make them as comfortable as possible. More than likely that will occur in in the chicken yard. On my little farm, I have 5 runs side-by-side with varied coop configurations. In addition, there are 2 very small coops for my growers. These two coops are perfect for the youngins’ but at about 3 months old, they must be moved to a larger area and somehow into one of the 5 runs and coops. Sometimes I find myself having to rearrange the girls due to size and space. As a result there is hardship on the weaker personality chickens because hen pecking is a truth. During a hurricane though, I have to let hen pecking take its course because rearranging who’s in what coup is a necessity. I definitely have to regroup and the girls don’t like it. For some days, I’ve been planning on what to do as hurricane Irma comes closer and closer. On the internet this week, I saw a photograph of chickens wrapped in newspapers as if they were swaddled like a baby. The owners were apparently Key West evacuees and transporting their flock to safety. In truth, I was shocked when I laid eyes on the image but the more I thought about that person’s plight, it may have been an ingenious idea to keep the chickens safe and sound. Each of us have to think about our own situation so as to do the best for our flock under the conditions in which we are faced. In that person’s case, evacuating from the largest recorded hurricane on record meant taking the flock as best as possible and safely. I’ve never seen a chicken swaddled but it seemed to work well. Who am I to criticize this chicken keeper when it’s obvious that safety was the number one concern for those chickens. Preparing for a storm has many facets and every chicken keeper must do what is in the best interest of his or her flock. Considering storm concerns: chickens don’t swim and can drown easily. Chickens are light and cannot endure heavy winds. Chickens are small and could easily be hurt from flying debris. Chickens have their own agenda and do not come when being called like a dog or a cat (unless you’re feeding them LOL). Chickens are not like ducks. They can sort of float- a while. Over time though, they get basically water-logged and will drown. The are not water birds. I have a pond near the coops. The chickens scratch and eat from the basin but never and I mean never go for a swim. Ever. The most water my chickens expose themselves to is sometimes stepping in their water bucket but that’s pretty much the extent of their water foray. A storm surge could be the death of one or a whole flock of chickens so I want to do all possible to protect my animals from storm water. According to reference.com, the average broiler weighs 5.80 pounds. It would never do for a chicken to be loose in a chicken run with 80 plus mph winds. Should chickens get in the wind surge of a hurricane it could easily toss the feathered friend to and fro. Chickens must be in a safe and covered area during a storm. During a storm debris is flying all over. Leaves, branches, home objects and more are being tossed all around. Chickens do not have the sense or agility to fend for themselves in such conditions. They must be inside a safe area and be taken care of during such an event. Chickens are chickens. They hunt, peck and run towards you when you have food. While they may come to you when you call, they are not like a cat or dog where they jump in your arms and wait to be carried into the house. Chickens are foragers and that is their life. Everyone has their own ideas on what to do during a storm. Here is what I did during Hurricane Matthew and will do again when Irma comes our way. Before the storm, I go ahead and try to put more chickens in each run so as to minimize use of coops during the storm. I use the strongest coops possible for their safety. Days before the storm, the coops are cleaned and prepared for the chickens. Fresh food and water is placed inside of the coop on storm day. This is highly unusual for our plan as they are fed in the runs on a general basis. To settle my chickens during the storm, I divide my 40 something chickens into 2 or 3 groups and put them into the strongest coops in the barnyard. I put a rooster in each coop and my old man rooster, Buster is placed in a coop of his own. He is too old to deal with the stress of other birds plus the storm. All of the babies or teenagers are placed together in a strong run and coop as well. I try to keep together the hens who already live together but I switch up their coops so that everyone is in a different environment. I know hen-pecking is going to happen but it seems better when everyone is in new surroundings. Depending on the time of the expected storm, I may let the chickens out or may need to keep them closed in their coops. Since chickens go inside on their own in the evening, I may need to depend on that for getting them into specific runs and coops. At that time, I find myself moving different chickens from one coop to another and I trying my best to do this during the darker part of the day so as not to upset them. We all know pecking order is a real thing but at least if they begin the pecking order it would occur the day of the storm when things are wild outside for all of them. In addition, most of them are in a new environment or coop which discombobulates them. Safety is the number one thing so as soon as they are in their coops and mostly settled, I put one screw in the door so the strong winds cannot cause the door to fly open. During Hurricane Matthew we were told there could be winds as high as 90 mph. To protect my brood, the coop must hold fast. By the time all of the chickens are in their runs and ready for the storm, all of the umbrellas, feeding pans, hanging feeders, watering utensils, whirly gigs and more have long been removed providing a safe area free from flying debris. Do what you must for your own. In Psalms it says that “every beast belongs to God” and he’s put us among them to be their keeper. Shaq, a Jersey Giant, tries on his NASA approved Great American Eclipse Sun Shades. (No animal was hurt during this eye exam). Tell the chickens the sky is not falling! In the story Henny Penny, the hen gets hit on the head with an acorn. From there she makes it a mission to go tell the king “the sky is falling”. On August 21, 2017 some 12 million people in the United States will see the moon come between the sun and the earth , turning the earth into dusk and causing a rapid drop in the temperature. This is the first total eclipse for the United States since the 1970’s and this one will only be visible in the USA. Many are calling this the Great American Total Solar Eclipse where from Oregon to South Carolina for about 70 miles wide the total eclipse will be seen. Far and wide, all chicken keepers should have a serious talk with the flock to assure them the sky is not falling, it’s just The Great American Eclipse. 1. The sky is not falling as Henny Penny may think, so have a discussion with your chickens concerning what is about to occur in their lives. Explain that this is a special event in the world and that although it will get dark during the day, it does not mean it’s time to retire. 2. Provide ample food and water for your birds as this may be a stressful time and generally speaking when live beings go through stress they like to eat and drink. 3. Remind your free-rangers that being aware of predators is still an issue. Because of this incredible event in history, a great many people will be off work and therefore will have their dogs possibly running free. Just because this is a huge phenomenon it would still be important to be vigilant. Other predators may be confused too and it is unknown how they will react to this special time. 4.. It will be important to note that a rapid drop in temperature will occur due to the sun being covered by the moon leaving the earth without the warmth of the sun. Remind the chickens that they may need to ruffle feathers for a short time during this brief cooling off. 5. Chickens should be reminded that they must stay on the egg-laying schedule. The brief darkness should not affect their egg production. The total eclipse should last only minutes. The very longest solar eclipse time will be 2 minutes and 38 seconds and that will be in Carbondale, Illinois. 6. It is doubtful, due to a chicken’s size that they would look into the area of the sun so glasses for chickens are probably not needed. However, for humans, NASA approved glasses should be worn. The chickens will need their keeper to be safe for future care. 7. This is an historic event and depending on where you’re located, it could be the event of the century for you. It is said that being in the “path of totality” will be an unforgettable experience. Characterisitcs– Hardy and often small, hardy birds, good egg layers, small birds, do better free ranging. Characteristics– Many times called the “Easter egger”. Various light color blue eggs. Personality-Adaptable, easy to work with, good with people, easy to manage. Characteristics– Rare breed, Many times called the “Easter egger”. High mortality rate, Various light color blue eggs. Color- Very unique appearance, no tail, ear tufts, Variety of colors including black , white silver, black red. Light blue eggs. Characteristics-Beautiful large bird. There are many dedicated groups who raise only this type chicken. The eggs are copper in color. Egg color is brown. Color-Black and white and beautiful. These are dainty yet hardy birds. They are good egg layers. Characterisitcs-You can find this bird’s photograph on the front of the feed bag at Tractor Supply. This is a plump chicken, hardy and great for keeping the eggs on the table. Characteristics- Heritage breed, Small petite birds until they grow large and healthy. The male has a huge wattle and tall legs. The ear lobes are large and white. These birds are quick and agile with a fan tail. Good egg layers. Personality- Our Leghorn are white in color. We have 4 hens and a rooster at this time. The rooster has a hot red comb while the hens have small combs and wattles. The all-white leghorn compared to the deep red comb and wattle really make them stand out. I’ve found these to be skittish more than other chickens that I have. They are quick and agile. Color-The leghorn is generally white with bright red wattles.Theere are non-white Leghorns. The legs and toes are yellow. White eggs. Color- Black with copper on the chest and down the front. Eggs are chocolate. Characteristics- Nice hardy bird for both table food and egg laying. Personality-Adaptable, easy to work with, good with people but can be stubborn and can bully. National Ice Cream Day and Chickens! Chickens are like any other pet you might have. You love them. Just as you would celebrate any pet’s birthday or some celebratory day such as “National Dog Day” or Cat Fancier’s Friend Day, chickens would enjoy a celebration as well. There are a few chicken celebration days such as – Rotisserie Chicken Day( June 2) Chicks Down South Month (August) and Chicken Lives Matter Month(November) and Chicken Dance Day(May 14) but it’s always good to stretch the love when you can. Today was National Ice Cream Day so, we(us chickens) celebrated with a Nutty Butty. It was oh such fun too! I hope you celebrate different events with your chickens. Below are some farm related celebrations that you might consider with your yard birds. Chickens rely on their sense of sight in order to live and most assuredly if they free range or if they live in the wild. There are atleast 15 free range chickens on my dad’s land and really they are neighborhood chickens. No one claims to own them and no one feeds them. They truly live off the land. These wild birds must live by their wit and part of their keen living is that of having incredible eyesight. Chickens have 3 eye lids; an upper lid, lower lid and a covering eye lid. Just as a human has a cornea, a chicken does also. It is clear and covers the iris and pupil of the eye. A chicken’s pupil is also like a humans in that it is the center black circle in the middle of the eye. With chicken’s eyesight the light enters the corner and iris and stimulates the retina nerve endings in the back of the eyeball. Chickens have tetra-chromatic vision. Humans have tri-chromatic vision. The Iris is the area of a chicken’s eye that has color. Chicken’s have keen and sharp eyesight. As a result, they are often find themselves spooks by the quick movement of something. This is why a flock of chickens might run quickly towards their coops if they catch an eyeful of something moving quickly across the sky. This keen eyesight was an adaptation given by God in order to help chickens ward off predators. Many a life has been saved by being quick to find cover or run to safety. Chickens do not roll their eyes. I fact if you are around chickens often enough, you will see their 3rd eye or eye-covering open and close periodically. Very often when they sleep they might close that part of their eye and when chickens are sick that eye often can be seen. Unlike a human, the outside eye lid of a chicken does not blink and chickens do not blink like traditional animal’s eyes. Chickens do not see well far away nor do they see well at night. As a chicken keeper, I have seen my hens run into a deep corner after dark and appear totally discombobulated. That is why chickens are wired to go into their safe space at dusk. Do you know that chickens love their independence? They do! We have our chickens in 6 runs. We try our best to keep them by breed. The first run has Jersey Giants, the 2nd has Rhode Island Reds, the 3rd hosts Buff Orpington, the next, Ameraucana , the 5th houses one huge brute of a rooster aptly named Buster and the 6th run is home to our teenage group; a mixture of breeds soon to be divided into the stable runs mentioned. We feed twice a day but we check on them often to be sure they have ample grazing food and fresh water. Now there are restrictions. We monitor their whereabouts all day when they are out. We constantly walk the road, look down the paths, look specifically for certain ones that may appear to be AWOL(absent with out leave). While they are allowed to have their freedom, we do expect each yard bird to be on her best behavior. If they are in the road, we shu them back to the yard. If they jump in the feed bin, we run them away. If they eat the garden and plants, we scold them, so there are definite restrictions. We do this for their safety. We don’t want them to get into trouble or to bother the neighbors. Today we celebrate our Independence as a Nation. This is a very special day for our country. The significance of this day is that the Declaration of Independence was adopted by the Continental Congress in 1776. This would remove our country from the rule of Great Britain. We as a Nation would be free. During this time it was said that “these United Colonies are, and of right, ought to be free and independent states”. 1. Open the chicken doors and allow your chickens to free-range in your yard. (foot loose and fancy free) . 2. If you cannot completely allow free-ranging, set up an area to change it up for your flock allowing them to graze in a different place than their normal run. (Use a baby gate, small fence, plastic fencing or netting to help you). 3. Select a few days a week to allow free-ranging. Maybe you cannot do this every day but you possibly can a few days a week. 4. Sometimes we allow free-ranging at the late time of the day because we know it gives them a limited time to be free in the yard which keeps them closer to the coops. 5. Place them in a separate fenced area for free-ranging. ( We have a backyard fence and sometimes we put them in that area and close the door allowing them to free range inside that fenced area. What area could you use? Whatever you do and however you can provide Independence day for your chickens, try to do it for their physical health and mental health. Chicken Lives Matter™ ? We’re about wanting to share ideas, tips and information to elevate the importance of these yard birds. Please help us! We’re looking for like minded people of country and faith who are chicken keepers. 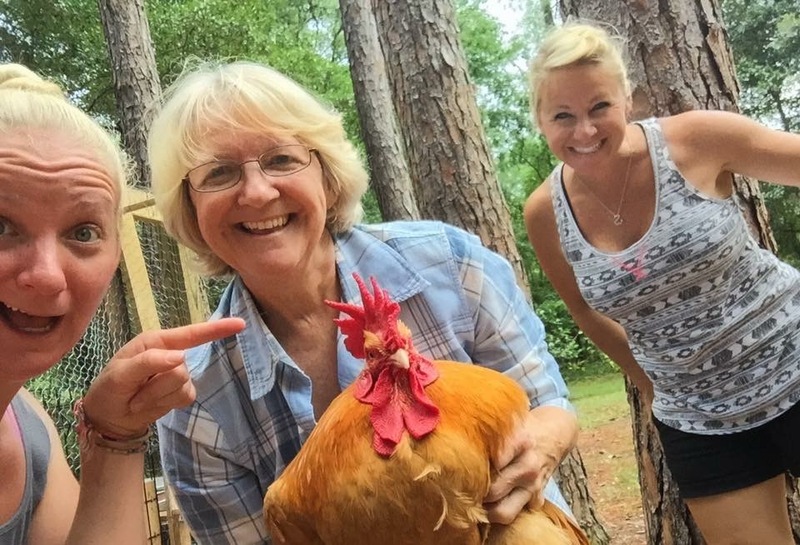 We have a desire for folks to join our efforts to talk about and learn about our hens and roosters. Please join us and chime in when you have some interesting things to say. Say it on Facebook.